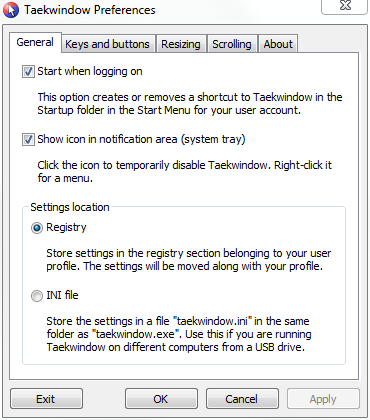 Taekwindow is a simple, lightweight and free Windows program that allows you to move and resize windows by dragging them with the Alt key, similar to many X11 window managers. If you’re a Linux or other Unix user, you are probably familiar with Alt-dragging. Once you have gotten used to it, you’ll want to use it in Windows as well. But even if you’re not used to Alt-dragging, it can still make your Windows experience more pleasant. Especially when you have a large monitor, or multiple monitors, you’re moving your mouse much more than you ought to. Taekwindow can save you time, frustration and RSI! push a window to the background by middle-clicking on its title bar. All these features can be configured to your liking. I’m convinced. How do I get it? Taekwindow is completely free. It is a tiny download, and does not require installation: you can be running it only seconds from now. Go and download it!